When it comes to getting students ready for school, Godwin Heights pulls out all the stops. 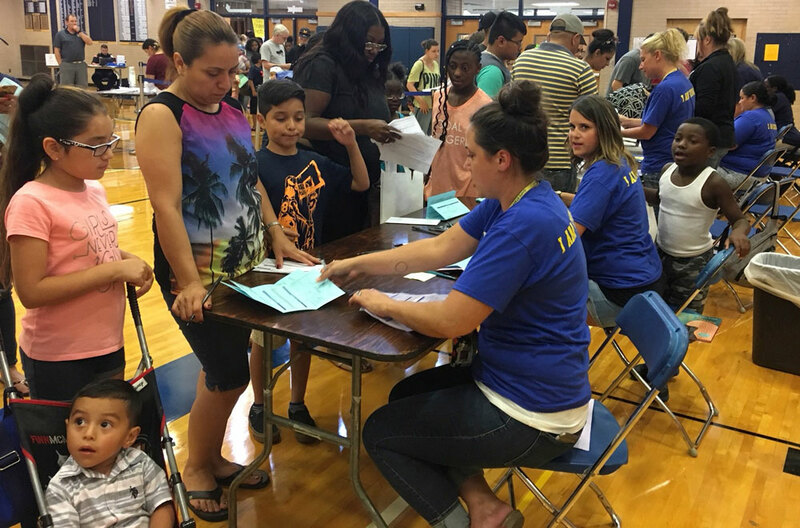 Parents recently enrolled their children for fall classes during the district’s fourth annual Enrollment Extravaganza in the high school’s physical education building. For mom Cecilia Beltran, it was an opportunity to make sure three of her five children – Jaelyn, who is entering third grade at West Godwin Elementary; Julian, who is going into second grade at West Godwin; and Jaedyn, who will start kindergarten – were signed up and ready to start classes Monday, Aug. 20. “I thought everyone was helpful,” Beltran said as she navigated her way from table to table. Carrie Worst, whose son Parker is entering his sophomore year at the high school, agreed. Last year was Parker’s first year in the school’s special education program, and Worst said she was impressed with the work they did with him. 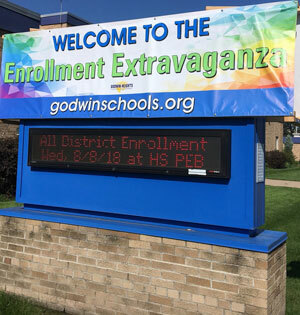 The gymnasium was lined with tables for the daylong event, as teachers and other district employees in blue T-shirts with the words “I Am Godwin” in gold lettering, assisted parents. 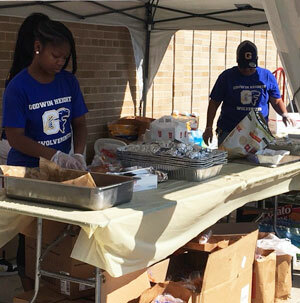 On the balcony, students smiled for school pictures while, outside, volunteers served hot dogs, burgers and chips. 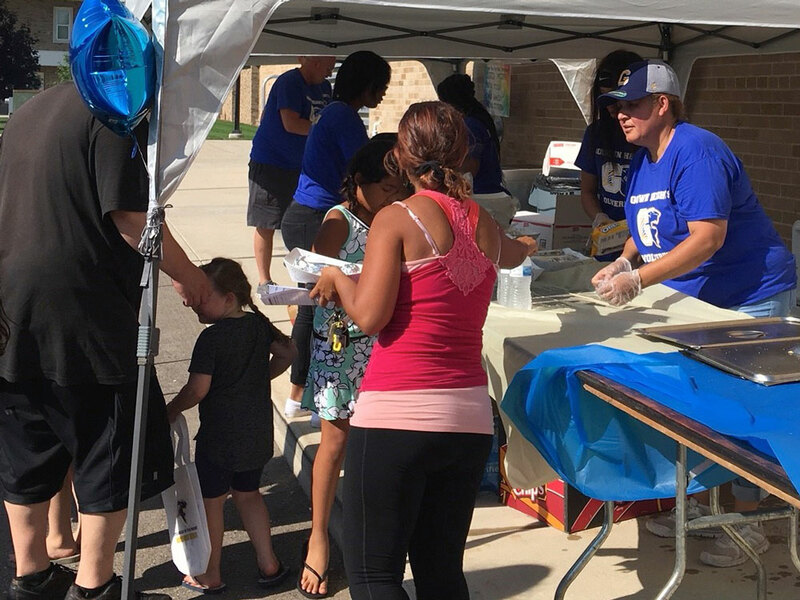 It’s “a one-stop shop” for parents each fall, said Executive Administrative Assistant Cindy Pate, lead organizer for the event. “A mother who comes in with an elementary (student), a middle schooler and a high schooler, she can enroll them with one person, at one stop, and she’s done – they’re all enrolled, instead of having to go to individual buildings like we had them do in the past,” Pate said. Enrollment Extravaganza started as a high school-only event. It went so well, administrators expanded it to the entire K-12 system the following year, Pate said. Pate said it’s hard to get a read yet on 2018-19 enrollment numbers, although she does not expect to see much change from last school year, when the district had about 2,130 students, a slight dip from 2016-17. She credited Godwin’s administrative staff and teachers for pulling everything together to make the extravaganza go as smoothly as possible. “We have teaching staff, custodians, paraprofessionals, administrators, coaches (involved) – it’s a team effort,” she said. Greg Chandler has worked as a journalist in West Michigan for 30 years. A graduate of Central Michigan University, Miami (Ohio) University and Grand Valley State University, he has written for The Grand Rapids Press and the Holland Sentinel, as well as several magazines. He is formerly the news director at WHTC-AM in Holland and also served as publicist for the Michigan Intercollegiate Athletic Association. In addition to writing for School News Network, he is a correspondent for The Banner, the official magazine of the Christian Reformed Church, and also broadcasts high school and college sporting events in the Holland area. He currently resides in Grand Rapids.